Because of the ex-Sheriff Joe Arpaio pardon, Maricopa county’s voters and more especially our minority communities are feeling unheard, unloved, and unsafe. Unfortunately, by endorsing his illegal, racially targeted policies at a national level, minority communities across America are being forced to feel those same emotions. To everyone who ever personally experienced racial profiling by officers under Arpaio’s management, and those who lived for decades with the rational fear that they could be targeted by his deputies because of their race alone, know that what happened to you will not be tolerated ever again. I and the majority of Valley residents, Arizonans, and Americans stand by you. We will never again idly stand by while you are made to question your legitimacy based on your race, color, and ethnicity alone. Illegal law enforcement action against you is illegal law enforcement action against all of us. Your anxiety is our anxiety. And just as we would not ask ourselves to live in an environment in which the pervasive fear of law enforcement is a wise adaptation, we will not ask you to do so, nor even allow it. Though it be of little comfort when your wounds have been freshly ripped open and salted, I hope you will find some satisfaction in the fact that the most important victories against Arpaio have already been won, and cannot be taken away. He has been removed from office. He has been replaced by someone who is committed to using his office for the equal protection of all. Arpaio’s policies have been recognized by the courts for the illegal, racially motivated programs they were. Law men around the country have been warned that implementing similar programs will result in costly litigation and get them voted out of office. May you find some consolation in these victories. For anyone who doubts that systemic racial inequality exists in America, perhaps the pardoning of Joe Arpaio will cause you to reflect and reconsider. 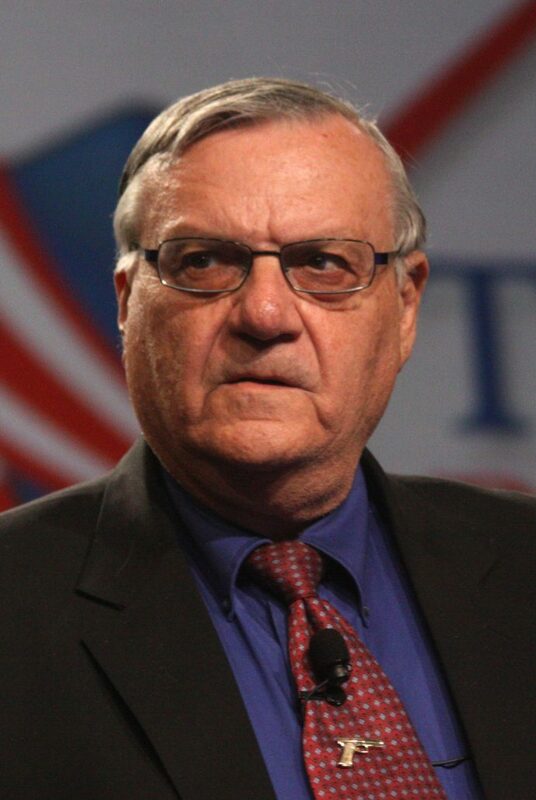 Arpaio was the one man in all America whose racially motivated law enforcement programs were so undeniably obvious that they were struck down in court. Despite those rulings, he continued policies of racial discrimination with impunity. And in the end, he has been pardoned by the highest authority in the land for those actions. He terrorized minorities without personal consequence. The court system proved too weak to rein him in. Despite many other legal systems that should have ended his behavior, only individual voters had the power to end his despotism. This is the definition of systemic racial injustice. If behavior on so vast and so obvious a scale can go unpunished, can you not also see that when individual officers who kill or harass minorities without the slightest provocation walk away legally untouched, it is evidence of the same systemic failures. Can you understand that Arpaio’s pardon says that “minority lives matter less?” Now, more than ever, it is important to work so all lives are treated equally in practice, not just in theory. Lastly, I would like to address those who agree with everything that has been said to this point. You will not change the world with your condemnation alone. Donald Trump pardoned Arpaio because he believes it will increase his power. He believes it will increase his ability to get votes and donations for his reelection in 2020, and also increase his influence in the 2018 elections. Donald Trump is talking to a powerful constituency that many of you are either ignoring or insulting. You may find it easiest to believe that his actions and rhetoric are aimed at pleasing proud racists. I have talked to many Trump voters and supporters, and have yet to personally meet any who support Trump explicitly on those grounds. While I know that thoughtless racists do exist in his base, the people who I have talked to are typically sincere and reasonably intelligent. If not for racism, then why do they support him? Because they feel like he talks to them and listens to them. They want a better life, and they feel like he has plausible explanations for why their life is the way it is and what he will do to make it better. One of those explanations is that illegal immigrants are easily crossing an unenforced border, after which they take good jobs and use public resources that would otherwise go to the kind of American citizen who voted for Trump. Trump pardoned Arpaio to show his commitment to that narrative and to standing up for the people who believe that narrative. Trump’s explanation is false, and his actions in support of that explanation are dangerous. But you will not gain power or influence over Trump’s base by simply shouting and screaming that Trump is an evil liar and anyone who supports him must be, too. Rather, you must compassionately engage with Trump’s populist base and show them better explanations for their situation and better solutions for helping them move forward. I affirm my commitment to engage with voters across the political spectrum in productive dialogue. If you are a Trump supporter who would like to share your feelings with me, please reach out; I will listen. If you are a concerned citizen who wants to learn a better way to interact with the Trump supporters in your network, please reach out; I will help. Together we can make Arizona and America a better place for everyone. In conclusion, I want to say again that my heart goes out to all of those who have been sucker punched by the news of this pardon. Joe Arpaio should have been held personally accountable for his actions, and it is a travesty that he won’t be. I wish you comfort as you try to process this news, grieve, and confront the realities of a world that does not yet treat minorities equally. Know that the majority of Americans do believe in equal justice for all, and we will not stop fighting until that vision is a reality. A brighter day is coming, and it will be because of the hard work of all those abolitionists and civil rights activists who have gone before, and all those who continue to labor today and into the future for a society that truly values and protects equality. Until that day, may you find peace. Help Me Get Clean (Elections) Could You or Someone You Know Be First Lady of Arizona?